Do you remember solving the famous Knight's Tour puzzle? Fill a 5x5 grid with the numbers 1-25 following the path of a knight. The Big Square is similar, but the rules are different. Either jump 2 horizontally or vertically. Or jump 1 diagonally. Difficult, fun and free. Antonio Cipriani is the author. Update: I've solved the 5x5 & 6x6 grids. 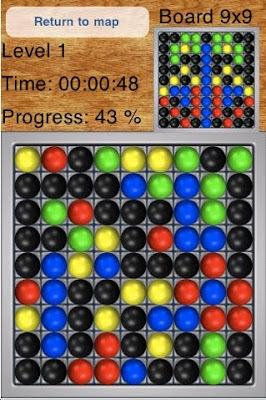 Got to 48 on the 7x7 grid. Very clever puzzle concept! Mikolaj Sikorski has created Amtalee. It's a rolling block maze. 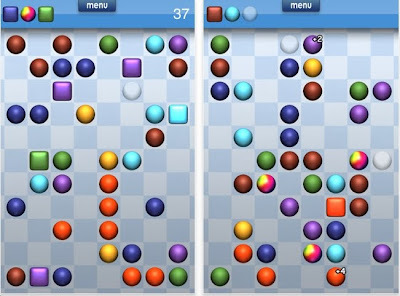 Very very similar to Bloxorz which you can play online here. The Traveling Salesman is a classic math problem: if a person has to travel to, say, 15 cities, what would the shortest route be? Rogo is similar, but different. 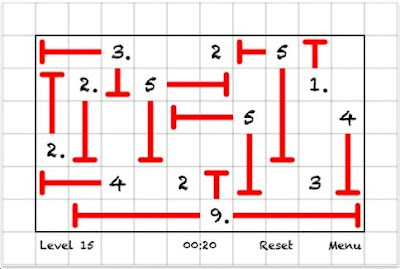 For each puzzle, your route must cover a certain number of squares, say 12. 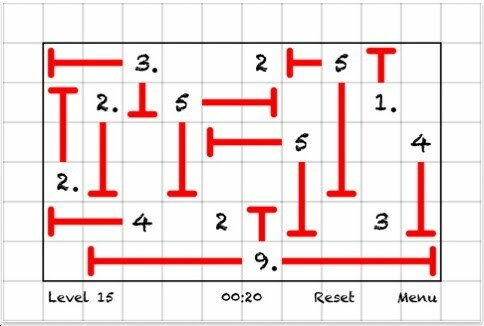 What route, covering 12 squares will score the most number of points? 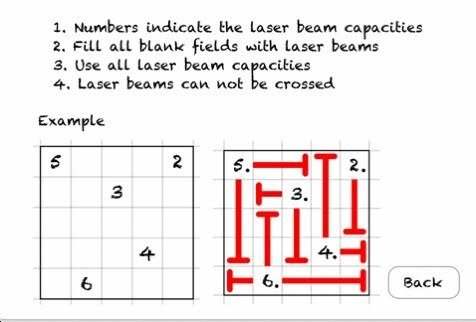 Very clever set of mathematical, logical puzzles. Dr. Nicola Petty from New Zealand is the author. She has plans for more puzzle apps. Roll and move a dice to the goal. 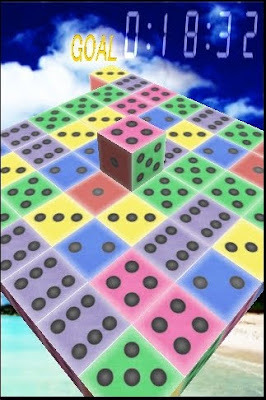 You can roll the dice only if the landing spot will match the face of the die. There is only 1 puzzle in this program. Is this a great, fun, fantastic, amazing puzzle app? No! Suppose you try to make an illegal move: the screen has an awkward way of informing the user. Hey, it's free. There is a 10 minute time limit. It took me about 6 minutes. I was distracted. Click here to order the puzzle. Oskar van Deventer - I've written much about him. My first article for Games Magazine was a 6 page story about his puzzles. That was February 2006. Games Magazine will soon publish my story about Oskar's 17x17x17 cube. It's impossible to own all of Oskar's puzzles because many are cost hundreds of dollars. This is due to the high cost of 3D printing. 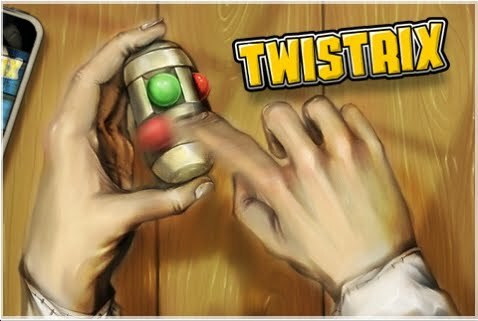 Unlucky Twist is now in my collection! It's a 1x2x13 cubic puzzle. It's not hard at all. But what's amazing is the telescopic mechanism that keeps all the pieces together. SmartBalls comes from Sergey Lesnichenko. 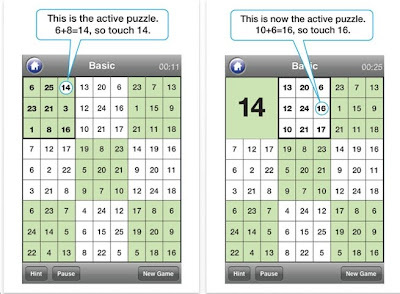 Slide the rows and columns to match the diagram in the upper right corner. 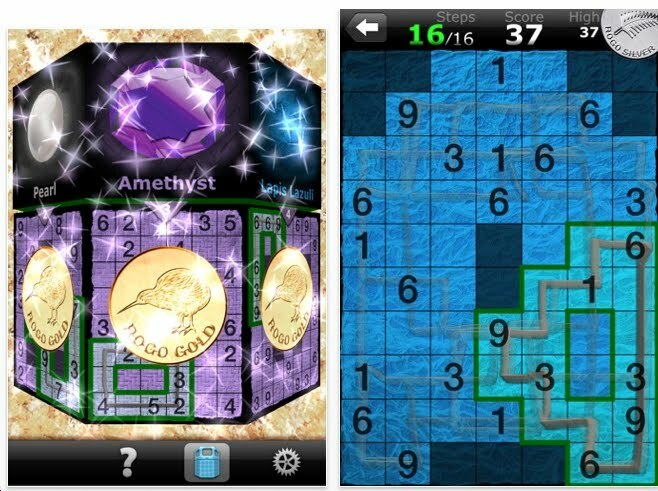 This is similar to other puzzle apps reviewed on this site. 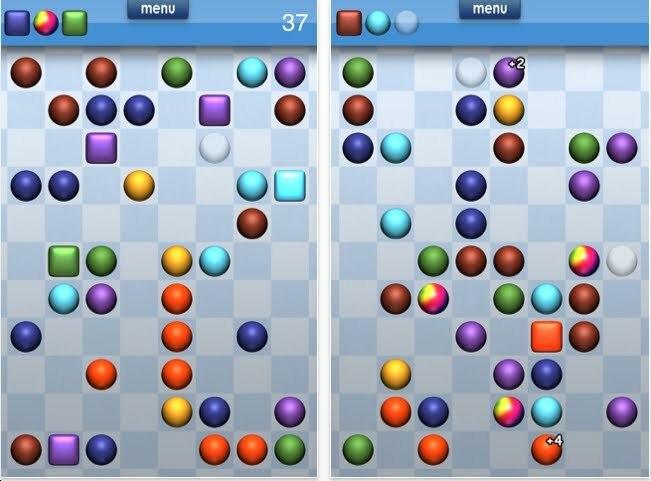 SmartBalls is free, so do a few puzzles. 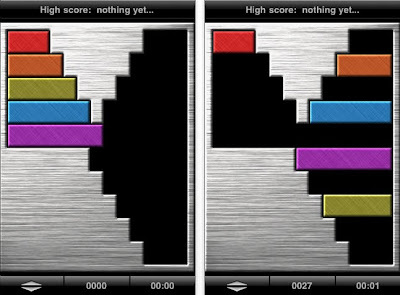 Ballentines is an action puzzle. 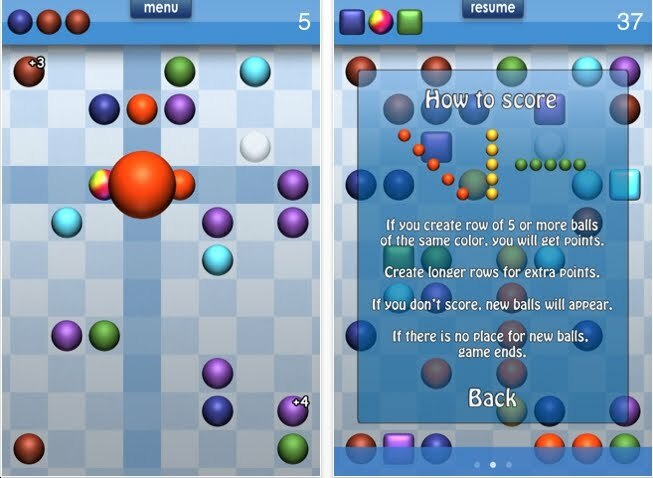 Move balls around to line up sets of 3 in order to score points. As soon as you score, more balls start to fill the screen a bit like Tetris. Hey, it's free, so give it a try! Sebastian Logod is the author. The Grabarchuk family has a long history of creating innovative, interesting and fun puzzles. 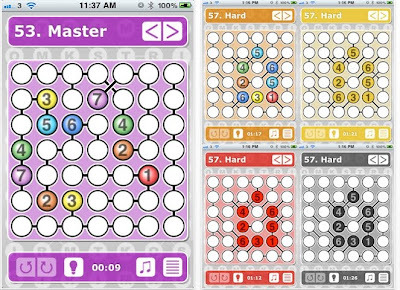 Strimko is essentially a twisted version of sudoku. Suzanne Davies is something of an expert in photography. So, if you're looking for some good iphone photography apps, click here. 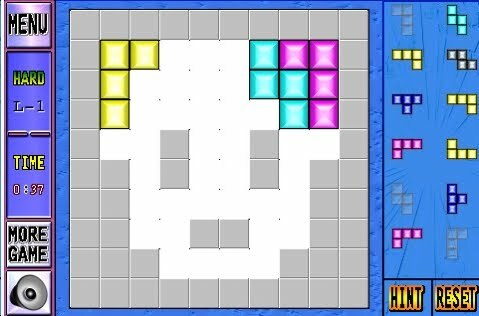 15 years ago the Rubik Empire released a CD-ROM of puzzles. One of them was called Cover Up. 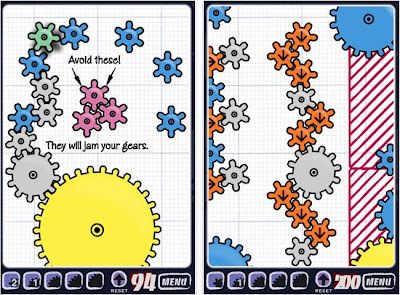 Great, fantastic, fun puzzle concept. 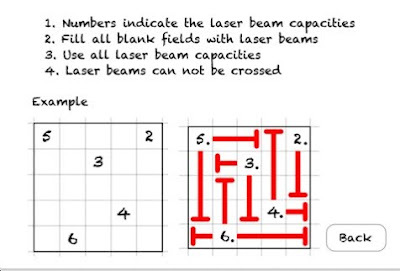 Ferhat Ayaz has created 50 puzzles of the same concept, now called the Beam Puzzle. 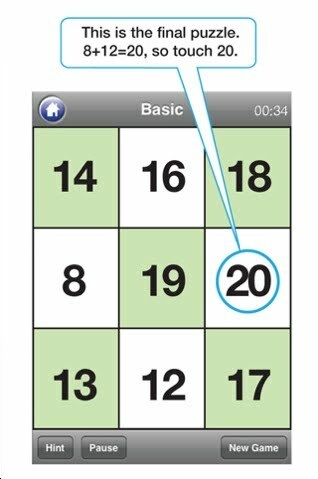 I have solved all 50 puzzles. It took maybe 2 hours. Let's hope he keeps going and produces another 50 levels. 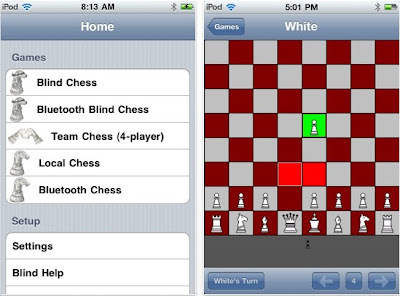 Blind Knights Chess comes from Aaron Coleman. I believe his sons Jonathan & David made the graphics and sounds! So this is a family enterprise. Here's the deal. 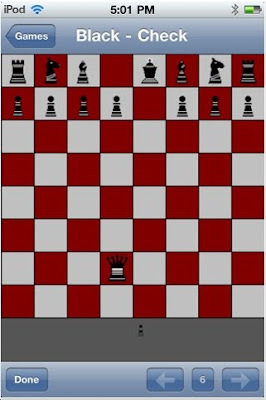 You make a move, but cannot see your opponent's pieces. Then you hand it to your opponent and your pieces disappear while his appear. Interesting concept among the hundred of chess variations that currently exist. Bravo! Untangle comes from Wang Yujin of Bluesky Studio. 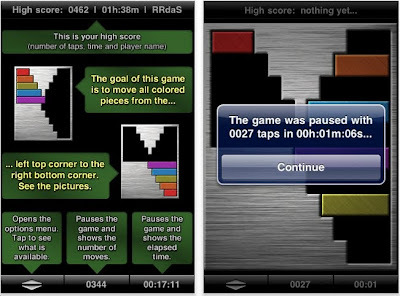 We've seen puzzle apps very similar to this. Visit http://www.planarity.net/# to play online with a big computer screen. 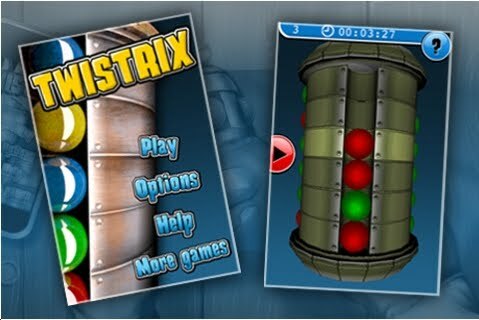 Twistrix is very similar to the mechanical puzzles Babylon Tower and Whip-It. 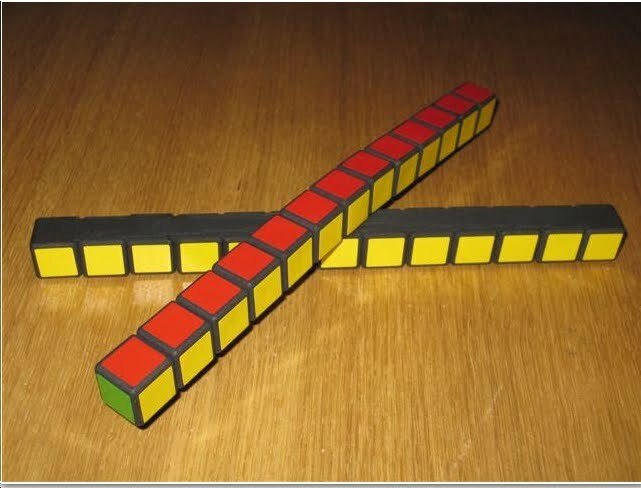 Easy puzzle. 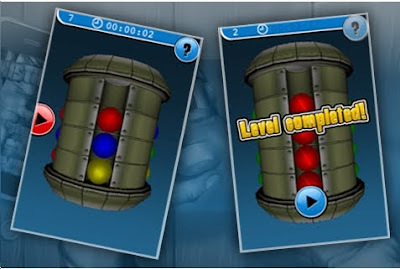 As you advance through the levels, the tower adds an additional level. Still, it's too easy. 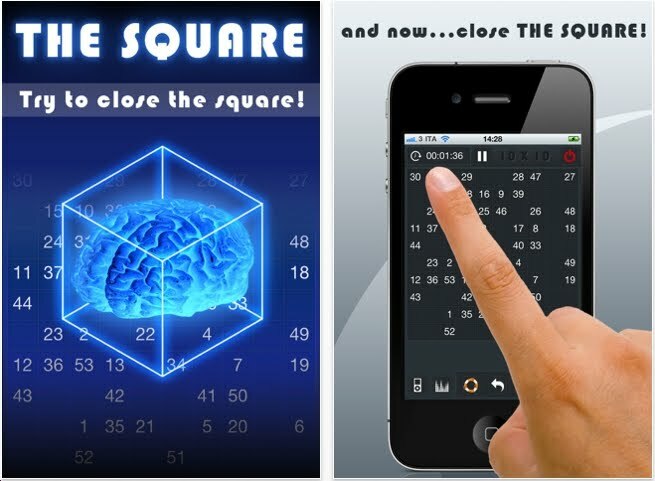 If you download this puzzle app, you won't have to buy those other puzzles. Hey, it's free! 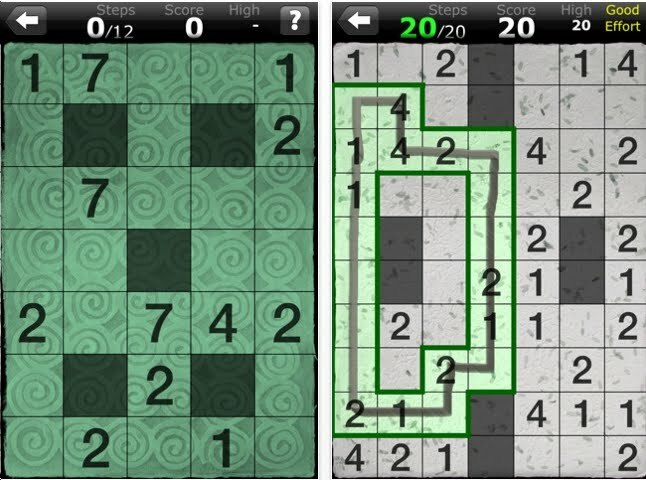 Free puzzle apps for Japan? Dennis Mengelt produced Boxed In, which I reviewed about 3 weeks ago. 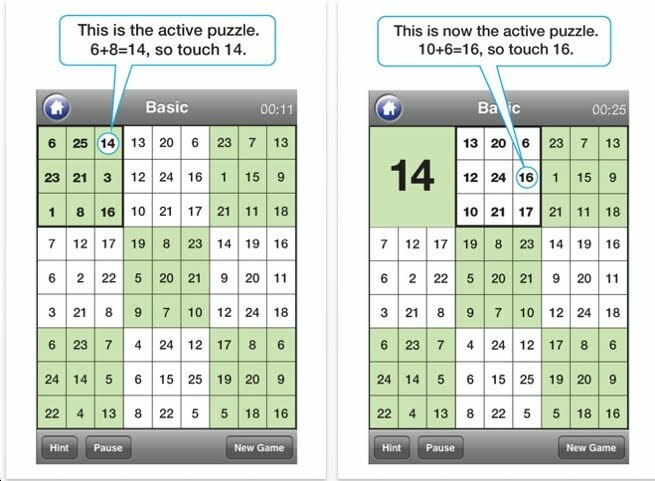 This week he is offering all of his puzzle apps for free in the hopes that users will donate that money to the Red Cross. Yesterday I downloaded Boxed In 2, Boxed In 3, and Iced In. I will comply with Dennis' request & send the $6 to the Red Cross. 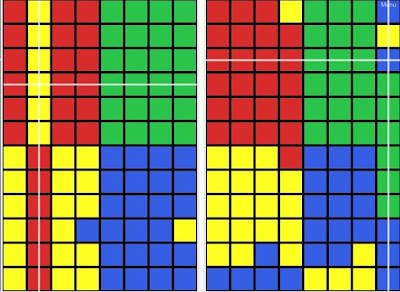 We've seen puzzles like this: slide the rows & columns so that all the red is in the upper left corner, green in the upper right. Yellow goes to the bottom left & blue in the bottom right. 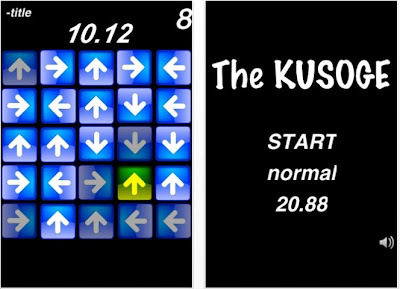 Not hard, but it's a good introduction to the genre of sequential movement puzzles. The seller is King Tat Lam. It's free! 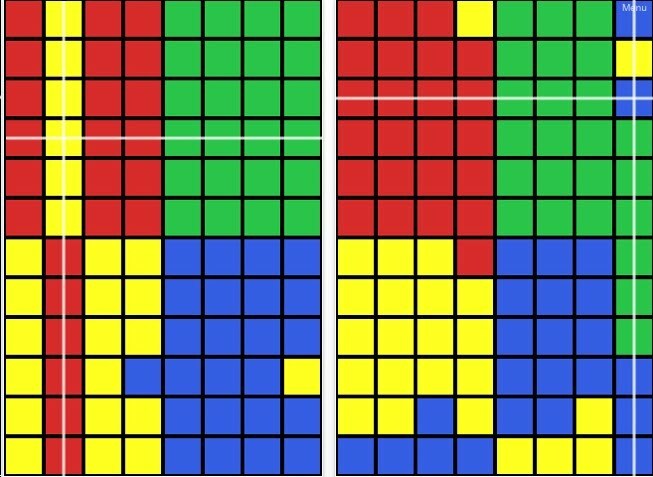 There are many robots that can solve Rubik's Cube. You can even buy a Lego set & assemble it to do this. Zachary Grady and Joe Ridgeway are engineering students who have designed a novel, surprising way for the machine to hold the cube. Very different from the Lego robot which sometimes drops the puzzle. Bravo! 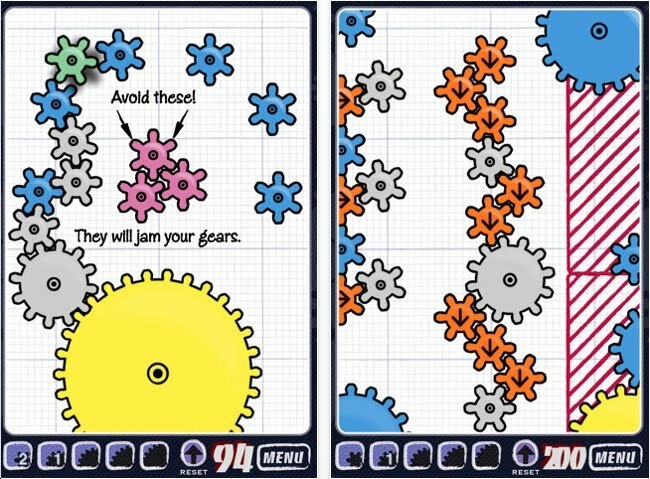 Geared is an interesting puzzle. The yellow gear is fixed and is always rotating. 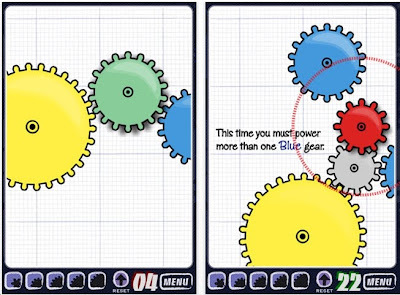 The blue gears are also fixed and needs to rotate. 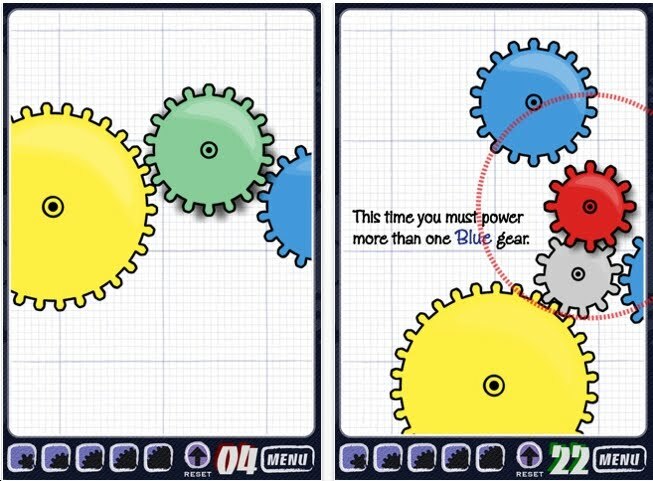 Object: place the other gears to link the yellow gear with the blue gear. I downloaded the paid version which has 150 levels. 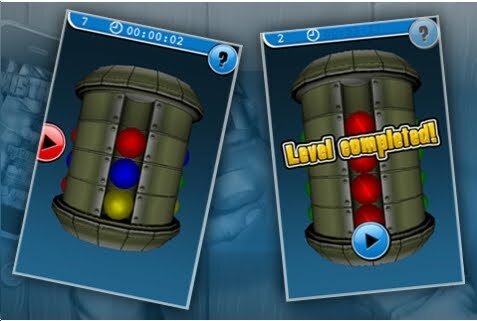 So far I've solve the first 45 levels in 1 hour & 11 minutes. Needless to say, the first 10 - 15 levels were really easy. Good value, good fun! Bryan Mitchell has made a small fortune off this I think! The game has been rated over 4600 times. It has over 2000 ratings with 5 stars too. Consider this: most people do not leave ratings or write reviews. 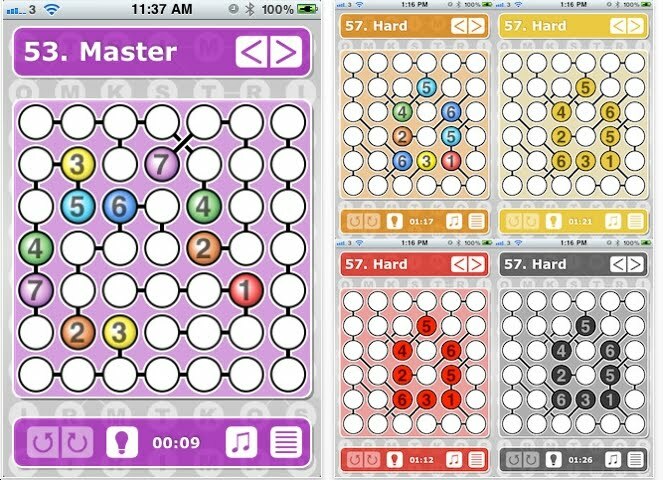 Kakooma looks like sudoku, but it's not! The images above describes the game perfectly. It's fun and it's free. Give it a try. Kusoge comes with no instructions! You would think that the folks at the Apple App Store would not release it for that reason alone! Kusoge starts with the arrow in the upper left corner being green. It then moves to the next arrow, depending on where it's pointing. The object is to tap the arrows to change their orientation so that every square will turn green at some point. Not hard at all. Daisuke Shosaki who created this said: Please do not expect too much. 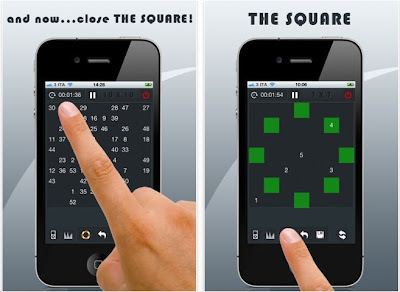 This is not a great fun puzzle app. However, a 10 year old might think it's brilliant. The bricks below the red line are fixed. The bricks above can slide side to side, not up and down. The object: the number of bricks above the red line should equal the number of bricks below the red line. Interesting and challenging. Completely mathematical & logical. Download the 'lite' version for free & test it out. 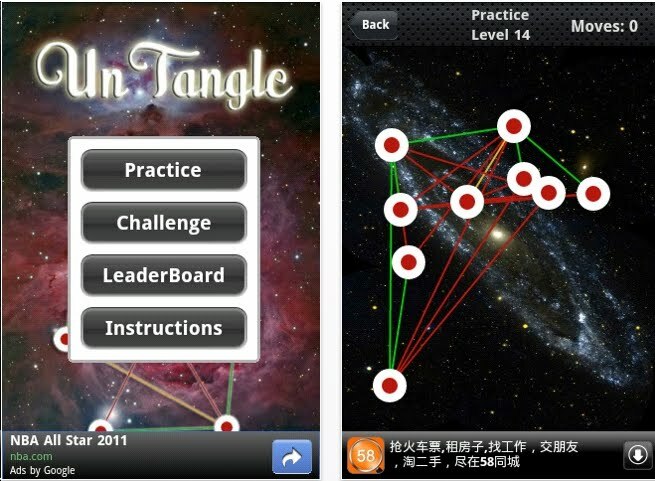 Brandon D'Orazio made this app. 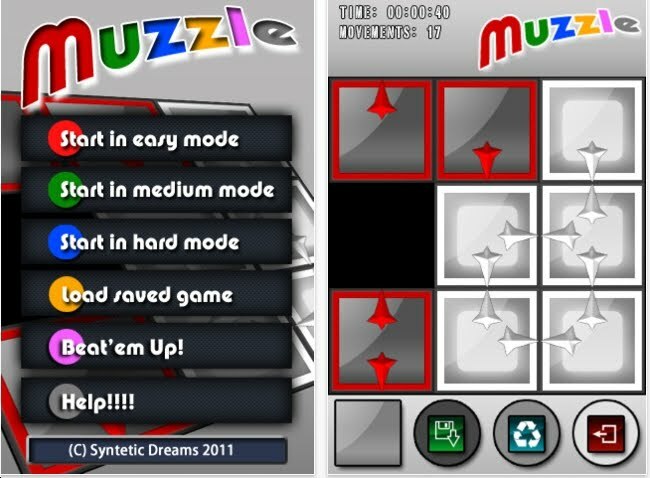 Muzzle is a combination of the 15 puzzle and more traditional edge-matching puzzles. 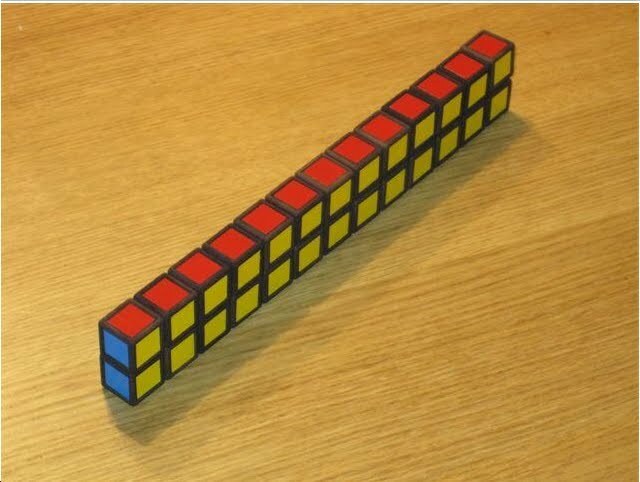 The image above shows a 3x3 grid. The medium level puzzles use a 6x6 grid. Much more challenging. Muzzle is made by Synthetic Dreams. Download the Lite version and take it out for a spin. Fit Shape is simple to grasp. Place the pieces into the grid so they fit! Duh! Not terribly hard. This is for young puzzlers and people into pentominoes. Some fabulous puzzles are being offered by generous craftsmen & collectors in order to raise money for the relief efforts caused by the flooding in Australia. Kagen Schaefer - superb puzzle designer. Tom Lensch - master craftsman. 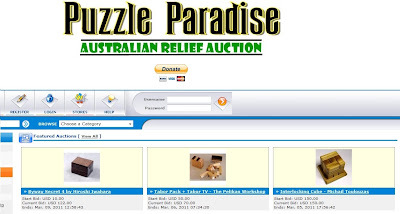 Pick any puzzle, bid, support the relief efforts & enjoy the puzzle. 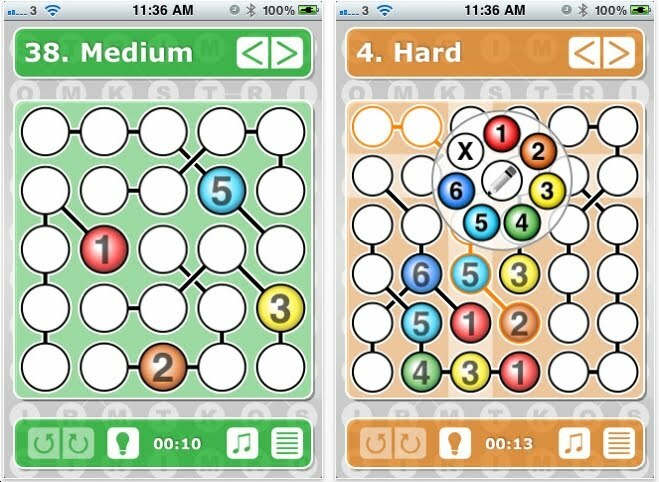 If you're a fan of Tower of Hanoi and its many variants, check out this free puzzle. 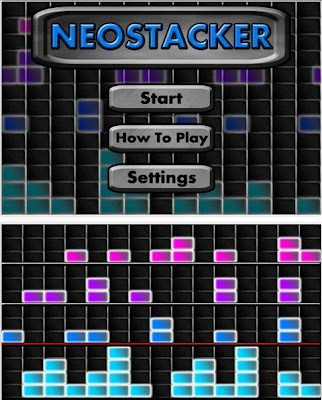 Object: slide all the bars from the top left area to the bottom right area.